Our 5th annual and first West Coast meet is now history and Im happy to report that well over 50 enthusiastic people attended. Members of the Art Deco Society of California came dressed in era costumes and brought their own Miss Art Deco whose real name just happens to be Mrs. Buick. Now thats what I call a perfect coincidence, I kid you not. In addition, they sent Pat Phillips, a professional photographer whose pictures appear in this column. Thanks to ADSC Communications Director Danine Cozzens for arranging it. 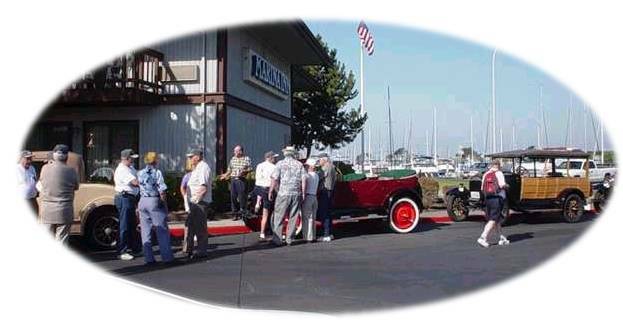 It all began on Saturday September 21st on a warm afternoon, when a group of Durant and Star motorcars started their engines and drove out of the San Leandro Marina parking lot. For some, this was their cars first real road test. Bill Hoaglan had just finished restoring his stunning 1923 Touring car before trailing it down to this event. 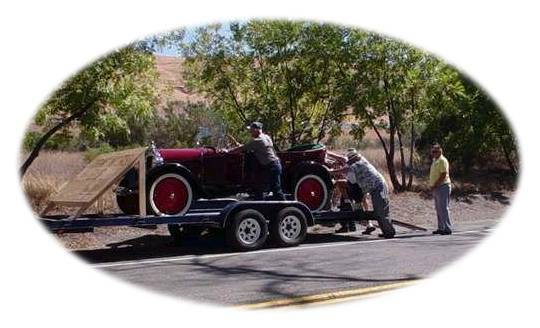 Barry Baums 1923 Woody had been running only three weeks and two other cars a 1924 Star Roadster owned by Lloyd & Joyce Garrison and a 1922 Star Touring car owned by Bert & Sonia Babick made the trip by trailer. 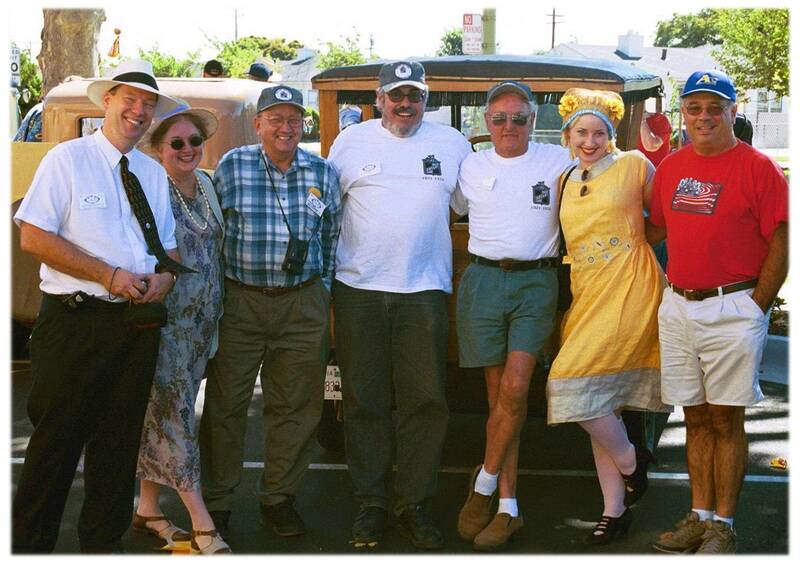 While Mike Larsens 1931 DeVaux, Lance Haynes 1929 Durant Model 6-66, Pam & Roger Von Bergens 1927 Star Sedan and George Trollmans 1930 Model 407 were already "Tour Tested". After getting started, we made our way to downtown San Leandro where we drove up East 14th street headed for Oakland. Our group knew we were getting close when we could see the Durant water tower in the distance. Then at 2:00 our cars pulled back onto the Durant factory grounds for the first time in over 72 years, we had arrived! Parking had been reserved in front of the administration building. After parking the cars, many of us took pictures, made new friends and paid a visit to the 1928 Durant on display just a few yards away. Mike Ghielmetti whose company now owns the factory, also has a Durant, you might say he has the complete set. Get it, the car and the factory? Oh never mind. Durants, Stars and a DeVaux werent the only antiques present. Before the meeting got underway, Al Botti served as our Vintage DJ and supplied a variety of Big Band music. The records used were original and made out of shellac. Some of the music was played from stainless steel wire on a device that predates the tape recorder to the late forties. In fact, our entire PA system was built in the 1940s by the Webster-Chicago Company and operated on glass tubes. You remember tubes dont you? To add a little more Era feel to the proceedings, our microphone was made in the 1930s. You dont think we got a little carried away with this stuff do you? While everyone was busy outside, Glenda Trollman was working inside taking care of last minute dinner preparations. Glenda made sure that we had enough tables, chairs, beverages, food and wine for everyone right down to the last detail. That was an enormous job and it made the evening a success. Thanks Glenda. Then sometime around 4:00 everyone moved inside the Administration building where, after settling down to dinner, the meeting was kicked off with a song. 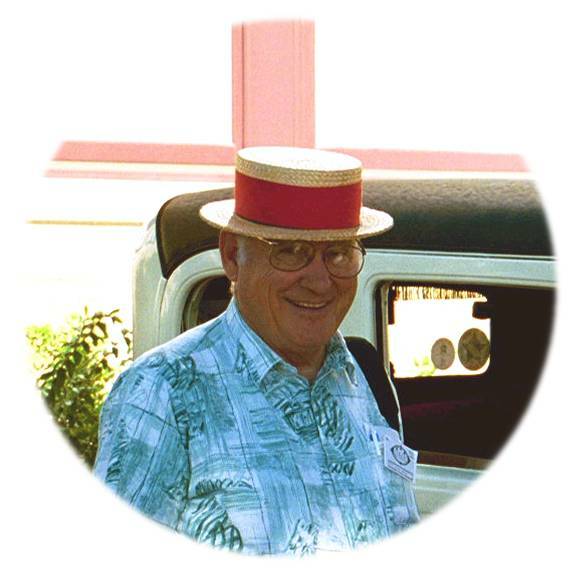 Long time member Keith Nordquist was unable to attend, so he sent a recent recording of the "I Want to Drive a Durant" song that he sang and preserved on CD. I think we ought to make it a new club tradition to play the song at each meeting. Afterwards, I conducted a shameless promotion for club merchandise. Its a fact that everyone who purchased something that day can honestly say, " It came from the factory". Then after extolling the benefits of why everyone shouldve purchased even more DMAC T-shirts, Hats, Patches and Step Plates, the business meeting got underway. Since others will report on the content of the meeting, Ill skip over to our journey back to the hotel. Sometime after 7pm the meeting came to an end and it was time to pack up and head back to the San Leandro Marina. The Sun had already begun to set and shortly after leaving the factory we soon found ourselves driving by moonlight. Robert Bush drove the chase vehicle and stayed in touch with the lead car by using an FM Walkie Talkie. My sincerest thanks go to Robert for volunteering to take this reasonability for both days; it proved extremely valuable to the group. A big challenge to any city tour are stoplights and traffic, this day proved to be no different. During the Durant era, this area was a rural farming community, today its part of Silicon Valley and densely populated. But Durant and Star fans cannot be stopped. Neither Stoplights, nor Sunset could prevent our group from making its way back to home base. Many then made their way to the DMAC hospitably room where most stayed late into the evening. Sunday morning was beautiful; the sky was blue and the temperature just perfect. 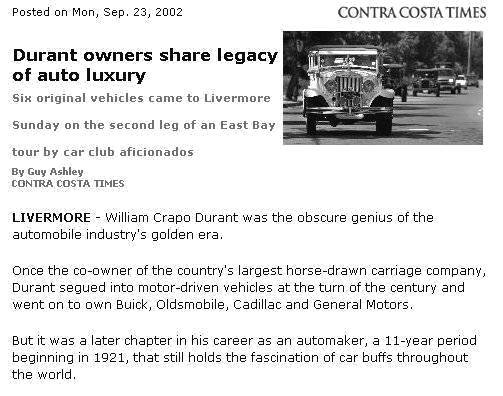 This was the day we would make our way to an original Durant/Star dealership located in Livermore. The building was saved, restored and managed by the Livermore Historical Guild. They promised to meet us there. We left the Marina and headed for the Niles district in Fremont. During the teens and early twenties, this was a small town famous for producing silent movies starring actors like Charlie Chaplin. In those days, it was notorious for its saloons and wild parties hosted by movie people. Now a quiet place known for its numerous antique shops and annual Charlie Chaplin Festival. We stopped here to stretch our legs and check the cars. Bill reported a loss of power, but all seemed to be in working order by the time we left. Once underway, we headed up scenic Niles Canyon road towards Sunol. For me, this was the most beautiful part of our journey. We crossed two very old bridges and drove through forested areas and countryside. During the summer, the local train club operates a Steam powered train that runs along side our route. We passed the sleepy village of Sunol, once a retreat for the wealthy Roaring 20s crowd and headed East on to Pleasanton. This was the last day of summer and the temperature had slowly heated up as we traveled. Unfortunately so did Bills 1923 Touring car, the engine developed a case of Vapor lock that forced him to stop. After diagnosing the problem, Bill decided to take advantage of the chase vehicle. From Pleasanton, we headed up to Livermore, where once in town, our biggest challenge were the countless Stoplights and Stop signs. Our group included six Durants and Stars, plus at least four modern cars that carried a total of 32 people. However, we did pull back together as we neared the Duarte Garage as its known locally. Once the old dealership came into view, we started hocking our horns and ringing our bells. 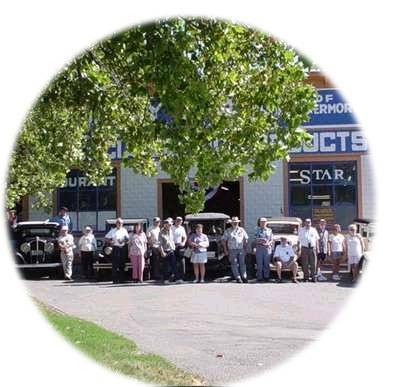 Members of the Livermore Historical Guild stood outside and waved us into the rear of the building, where, after driving for three hours on a hot summer day, we were greeted by a large group of friendly people waving, cheering and clamping. It felt like a heroes welcome! I lost track of time once we got inside the garage, everyone got busy viewing the displays and talking to LHG members. Lance signed up the DMAC as a sponsor of the Livermore Heritage Guild and paid the first years dues on the spot. Several others purchased beautiful LHG t-shirts that displayed the Durant/Star dealership. Then it came time to drive the cars out in front of the building for photographs. Everyone can now say that they drove their cars right off the showroom floor. The Valley Times sent a reporter and photographer to cover our arrival. Several people in our party were interviewed and the following day the paper printed a story about our trip on page three, we later made the front page of their website. You can read the full story on our own website in the Club Events section. Later everyone said farewell to Bill Junk, Tim Sagel and the other wonderful folks from the LHG and headed down the street for lunch. After our meal it was time to drive back to the hotel. We drove through Livermore, Pleasanton and Sunol and as the sun began to set, we entered the tree-covered hills of Fremont. It was about this time that we could feel the air begin to cool. Back in Livermore temperatures had reached 104 degrees Fahrenheit (40 Celsius). We made a brief stop in Niles and then continued on to the San Leandro Marina. The entire group arrived back by Sunset. It had been a full day, but it wasnt over yet, oh no. Many folks made their way back to the hospitality room for yet more Durant talk and yes, they bought more club merchandise. By the way, club member Frank Lersch who wasnt able to attend the tour, but was able to meet us at the hotel afterwards, brought a picture of his 1932 Deluxe Coupe. By a lucky coincidence he ran into another member that had owned his car 25 years earlier! 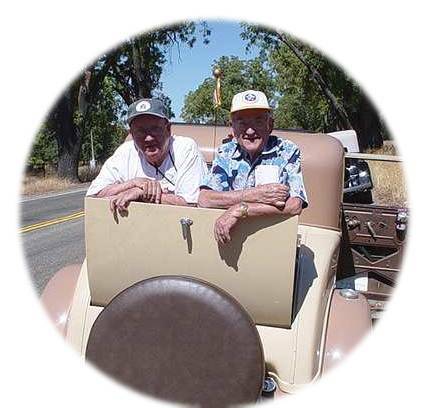 Thanks to Randy Banke for planning our route from Niles to Livermore, Glenda & George Trollman for a wonderful dinner plus everything that went it and Frank Lersch for suggesting our hotel.